Laura stayed in a private apartment in the resort of Miraflores. Laura is a frequent visitor to the Malaga and Miraflores area. Always using Malaga Airport Transfers for all her transfers when she is travelling over and rates the company excellent. 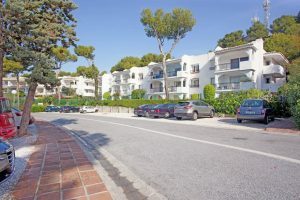 Miraflores in situated in the hills and countryside above the resort of Riviera del sol 35 mins drive for Malaga airport. The nearest beach is 40 mins by foot and 15 mins by car. La cala de mijas and Riviera del sol are awash with great restaurants beach bars, also many shops. Laura answered all eight questions giving an excellent mark to accommodation, places to eat, pool area and nightlife. Her favourite bar was The Lounge serving beers and hot snacks which were situated across from Laura’s apartments. Emma Bishop stayed in the Costa Del Sol resort of Benalmadena. Arriving in Aug 2018 along with her family staying at the Los Patos Park Hotel. The journey time from Malaga airport is only 20 mins and cost Emma 65 euros return for her family of four passengers. This hotel offers the quality of a 4 star hotel with the fun of a hotel with water park. It is a perfect hotel for families who want to enjoy their holiday with the comfort of an all-inclusive board hotel in Benalmadena . The hotel is close to the beach, and offers its clients a complex integrated by a water park. 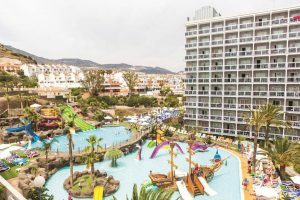 Los Patos has 4 swimming pools, 2 of them with slides, a complete day and night entertainment service, a games room and an amazing mini club for children ages 5-12. The children’s entertainers organize a variety of fun activities such as crafts and games. Emma also gave a mention to Cocos Bar which is situated five minutes walk for the hotel. Cocos has an extensive menu serving breakfast all day and food to satisfy anyone ranging from burgers, steaks and ribs, fish and chips, curries and a wide selection of tapas. All live major sports are shown on the numerous screens at Cocos.